Simon Pagenaud has knocked on the door of victory lane in each of the first two races of the 2016 Verizon IndyCar Series season. Today at the 42nd Toyota Grand Prix of Long Beach, the Frenchman broke through to earn the win. Toyota Grand Prix of Long Beach from The Sunday Drive on Vimeo. Pagenaud, in the No. 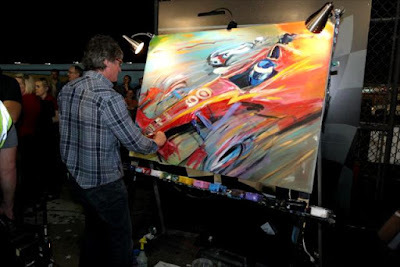 22 PPG Automotive Refinish Chevrolet, edged reigning series champion Scott Dixon across the finish line by 0.3032 of a second, the closest finish in the 33 Indy car races held at Long Beach and the fastest ever with an average speed of 100.592 mph. It gave Pagenaud five career Verizon Indy Car Series wins and his first since joining Team Penske in 2015. Pagenaud, who finished second in each of the first two races this season, takes a 14-point championship lead over Dixon into the next event, the Honda Indy Grand Prix of Alabama at Barber Motorsports Park on April 24 (3 p.m. ET, NBCSN). "This is my favorite street course," said Pagenaud, a two-time winner in sports car races on the 1.968-mile temporary street course, but who took his first Indy car victory here today. "To win here, especially in INDYCAR, given the level of competition, is amazing. The PPG car is good luck on me. Every time I'm in that car, I'm on the podium." Starting the 80-lap race third, Pagenaud took his first lead on Lap 52 when teammate and pole sitter Helio Castroneves made his final pit stop. Pagenaud was able to push two laps farther before stopping for fuel and tires, exiting the pits just ahead of Dixon and Castroneves. 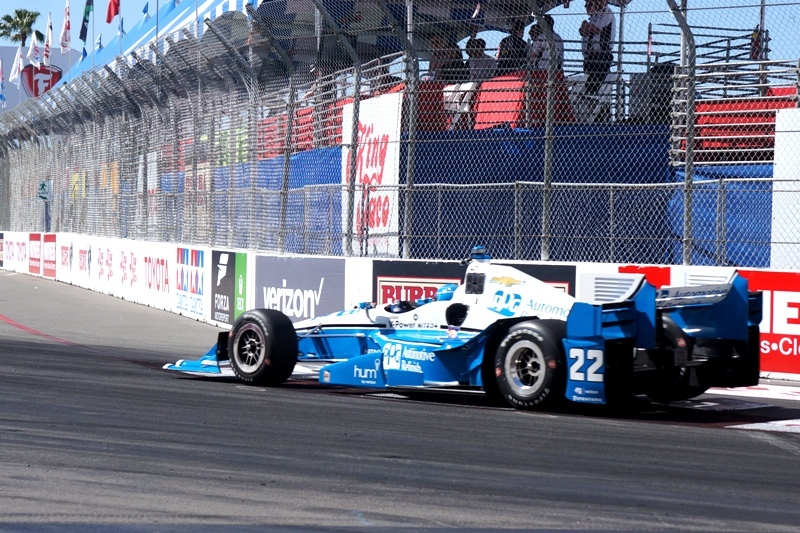 INDYCAR race stewards warned Pagenaud for improper lane usage exiting the pits, but he was able to lead the final 25 laps to collect the win in the first Verizon IndyCar Series caution-free race since Mid-Ohio in August 2013 and the first completely green-flag race on the often-chaotic streets of Long Beach since 1989. Dixon, in the No. 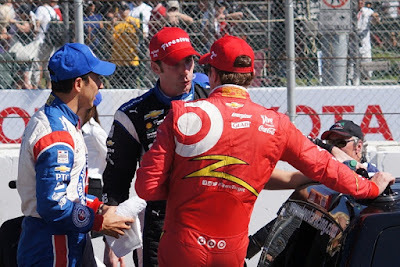 9 Target Chip Ganassi Racing Chevrolet, believed Pagenaud should have been assessed a stronger penalty, but was resigned with the runner-up finish that kept him second in the standings. Pagenaud leads with 134 points after three of 16 races, Dixon has 120 and Team Penske's Juan Pablo Montoya is third with 106. So just how does an annual charity event that lasts 40 years and raises more than $2.3 million to the “Racing for Kids” organization on behalf of this race and its participants by Toyota Motor Company get started? 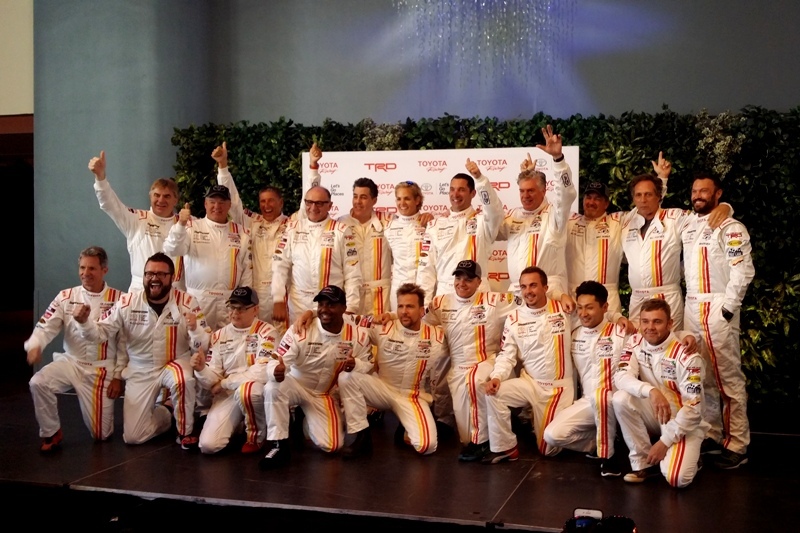 According to Chris Pook, founder and organizer of the Grand Prix of Long Beach, through a simple gathering of motorsport competitors at a pre-race C-300 volunteer organization cocktail reception. 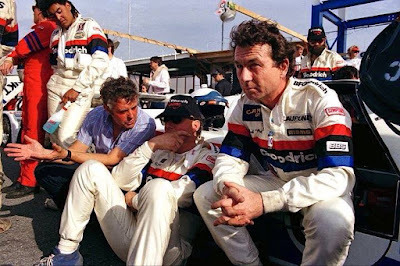 A party where a prodding and joking attitude spurs the wish to see famous world champions and motor culture standouts racing side-by-side on a young, newly formed street race course. The gathered group with Chris Pook included Theodore Racing Formula One car constructor from Hong Kong - Teddy Yip, INDY500/CART/NASCAR car builder, team owner, driver, and 11 year world Formula One competitor - Dan Gurney, former world Formula One champion - Phil Hill, and world Formula One champion - Graham Hill. The conversation that had Teddy Yip mention how great it would be to see these famous people perform in a demonstration race was shared with the Toyota Motor Company's Marketing Director for the Toyota offices in Torrance - Al Hagen ... and the rest, as they say, is history (see video above). Another ex-F1 driver, Bob Bondurant, showed up and in 1975, four Toyota Celica cars, outfitted with Simpson 5-way driver harnesses, performed a five lap exhibition race on the track through the streets of Long Beach. This final edition here in 2016 was raced with equally race-prepared 210-horsepower Toyota Scion FR-S 2-door sport coups. Celebrity winner in 2015, and 7-time charity auction winner. 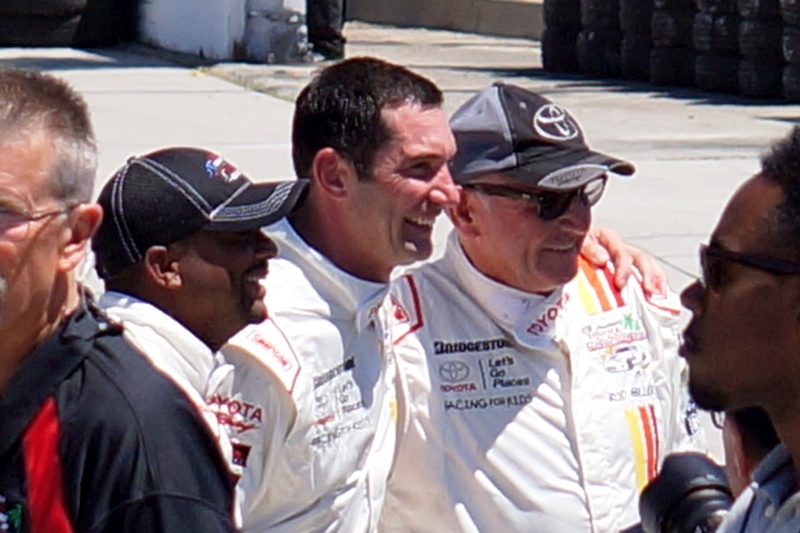 A retired insurance executive, he has participated in this race six times, donating a total of $417,000 to “Racing For Kids.” He is also an executive producer of “Road Hard,” starring Adam Carolla. Carter is the Senior Vice President of Automotive Operations for Toyota Motor Sales, U.S.A. The race, itself, was as raucous a contest as was predicted ... damaged cars, YELLOW Flags, and a FULL Course Red Flag stopping the field during the race due to the potential injuring of a course worker that could have ended up a lot worse than it looked on the broadcast ... which was bad. 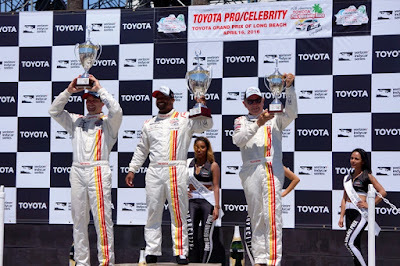 In the end, Alfonso Ribeiro won the 40th and final Toyota Pro/Celebrity Race, truly a fan favorite event at the Grand Prix of Long Beach that will be missed more than Toyota or the Grand Prix Association of Long Beach, at this moment, knows. 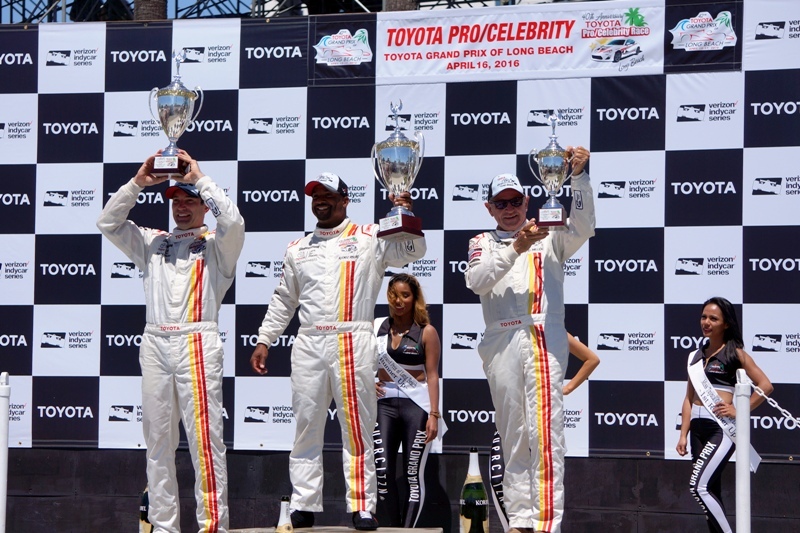 From Left to Right: Max Papis P2 celebrates with the last and 40th winner of the Toyota Pro/Celebrity Race, Alfonso Ribeiro and P3 Rod Millen during their victory lap around the track at the Toyota Grand Prix of Long Beach. Image Credit: Edmund Jenks (2016). 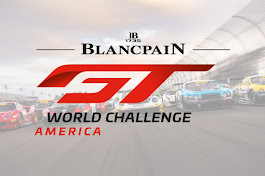 “The pace of this race was extremely fast and the drivers were very competitive at the start,” said President and CEO of the Grand Prix Association Jim Michaelian. “There was some exciting action in the field that had the fans on their feet, and we are glad everyone will walk away unscathed. 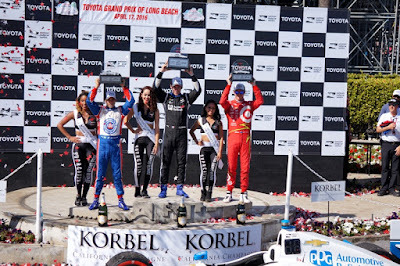 The story of the 42nd edition of the Toyota Grand Prix of Long Beach race in Round 3 of the Verizon IndyCar Series was told without pause (Yellow Flag) for debris, accidents, or just to take a breath. ... crossing it as the Checkered Flag flew with a 0.3032 of a second margin ... the closest finish in the 33 IndyCar/ChampCar races held at Long Beach and the fastest ever with an average speed of 100.592 mph. 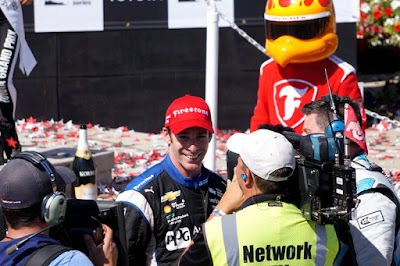 This was Simon Pagenaud's first win since joining Team Penske as it's fourth driver with Will Power, Juan Pablo Montoya, and Helio Castroneves. By crossing the line ahead of Scott Dixon under controversy of a violation of Rule 7.10.1.1 (found on Page 97 - highlighted in post-race comments below), it gave Pagenaud five career Verizon IndyCar Series wins overall. Q. In the drivers' meeting, what was the rule regarding your right-side tires and the yellow blend line coming out of the pits? What did they tell you you had to do with your right-side tires? 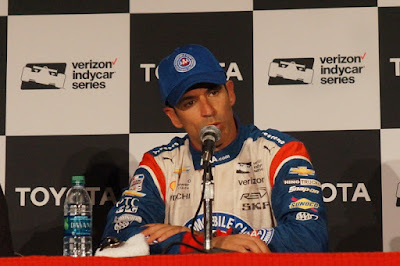 HELIO CASTRONEVES: I will not go into that. I don't know. I don't remember to be honest what they said. But certainly in practice we have to look -- what we've got to do. I don't recall. Q. It's rare for a street race to go green the whole way. Would you like to see a longer race next year? HELIO CASTRONEVES: You're right, it's very rare. I guess that's one of the things related to the aero package. It's very difficult to get close to another guy, at least I was having this issue. I'm not sure about Scott. But I feel that probably those are the scenario. So if you don't get even close, you can't take a chance, or young drivers cannot make mistakes, and the yellow doesn't come up. I don't think it's a matter of long distance. I think it's just a matter of that kind of scenario, and that's why it was very difficult to pass. THE MODERATOR: I'd like to welcome the second-place finisher today, Scott Dixon, driver of car No. 9, the Target Chip Ganassi Chevrolet, reigning series champion, with a second-place finish today. Still second in the points, 14 behind Simon Pagenaud. Take us through your day today, please. 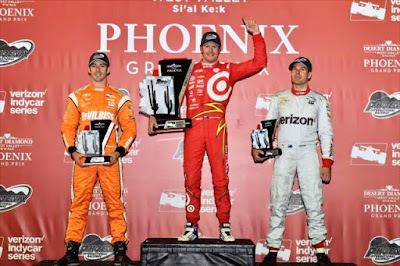 SCOTT DIXON: Yeah, it was definitely a pretty fierce battle up front, a bit of lapped traffic, some pit stop sequence, people trying to pit short, go longer, etc, etc, so it was quite exciting, I think, for ins and outs and when to use your overtakes and things like that. I think on the last one we got caught off guard a little bit before the pit sequence had already been finished, and then to hear when we're coming down the straight that the 22 was just coming out, we had actually backed off already and started saving fuel. With the gap that we had on Helio, I really didn't think we had to worry about too much and didn't get any warning from the pits. Obviously that scenario was a lot closer than we anticipated, and then when we got to Turn 1, it appeared that Simon turned a little early and crossed the line that you're not meant to cross. But it is what it is, so second place today, and Team Target did a hell of a job, and pit stops were clean, and I think we had really good pace, but personally I think we should have won the race. Q. Scott, I'll ask you the same question that was asked of Helio. Coming out of the drivers' meeting, how did you understand that yellow line at the end of pit road, how was that supposed to work for the drivers? SCOTT DIXON: This one is always very clear and is always mentioned, and we have two drivers' meetings a weekend, and it was clearly stated. I think if you look at the PDF, it's even in the PDF view that everybody gets, and I believe in the first one on Friday, it was asked several times about that. By all means any time you could not put more than two wheels over the line, and that was my understanding. I thought we were done with warnings and all this sort of wish wash stuff and we're going to stick to hard rules, but obviously that wasn't the case today. 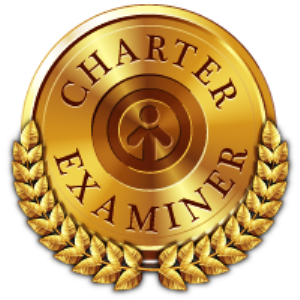 THE MODERATOR: If we can clarify at this point, the rules violation that was put into effect was Rule 7.10.1.1, which is lane usage, which reads, "Failing to follow designated procedures entering or exiting the pit area, including the proper use of the acceleration and deceleration zones." Now, within the new penalty guidelines that were established this year for the race stewards, they do have the capabilities of issuing just a warning under that guideline, and that was a decision of the race stewards that it was the best decision in that instance to issue a warning. SCOTT DIXON: In defense of that, I thought we had outlawed warnings. Yes, a warning was clarified at some point, but this was the problem we had in the offseason with people getting warnings all the time, especially when you're using it to your advantage when it's the last pit stop sequence or anything like that. If you're just going to get a warning every time you're going to do it, that's why this was discussed so deeply in the off-season, and why there was about 40 or 50 warning zones in the rule book removed. Obviously a few topics of conversation after this weekend. I don't even know why we discussed the pit lane exit if we're not going to stick to rules. Everybody else abided by it. Q. My question is kind of on the same tone. The way I understood you say that is that for that particular rule there's a warning in effect, so what rules have warnings and which rules don't? THE MODERATOR: There was a guideline, penalty guidelines document that was issued prior to the Phoenix race a couple weeks ago, and as I said, this one does have the ability for the steward to issue either a warning or to order a car to the back of the field for what they determined a mid-level penalty or a maximum penalty, which would be a drive through and/or a stop-and-go penalty. The race steward decided to issue the warning in this instance. Q. Scott, you're pretty collected; is that Kiwi reserve, or do you have a speed bag at home to take out some frustrations? 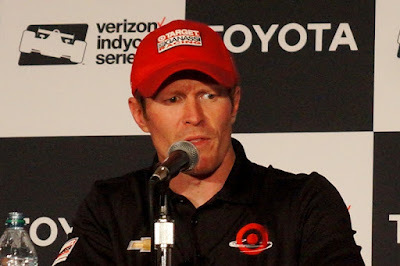 SCOTT DIXON: Well, I was pretty mad once I got out of the car even with the last sort of 15 laps waiting for a drive-through or at least a swap of positions. I was even a little mad at Simon after the race, but it's not his fault. You've got to try to take advantage whenever you can, but he doesn't make the rules or put the rules forward. Huge credit obviously to Simon. He raced a fantastic race, and it was a great win for him and the team. You know, I can't be mad at him, so I'll direct my anger some other direction. Q. Could you see the violation? Did he not appear where you thought he would as you're coming down the front stretch? SCOTT DIXON: Yeah, it definitely seemed a lot closer. When you're coming down there and we go through this scenario every practice session, every qualifying, etc, etc, and typically when you see the car, they still have to go down quite a ways to then turn back, which tries to stop the cars merging or hitting each other on the exit, and it seemed closer than normal. But when you're in those confines and going at the speeds you are, it is sometimes a little hard to judge. Q. You've been to a lot of racetracks around the world; can you imagine some sort of physical barrier, rumble strips or whatever, not to block the track for people not pitting, but can you imagine some barrier that would take away the whole idea of a judgment call there so you've got to go around it or you don't? SCOTT DIXON: It shouldn't be a judgment call. It's a rule, so that's what it comes down to. Q. Scott, I'm curious what it's like for the driver in the cockpit, just how far in front they can see with the way the front wing is, because when Simon was interviewed after the race he was asked about that exit and the warning, and he said, well, the rule was as long as I kept my right-side tires to the right of the dots, I was fine, and he clearly missed like about three feet of those -- there's some little things down there just to the right of those yellow lines, so he thinks he didn't violate anything until he'll see the video, but I'm just wondering what you can actually see in the cockpit. SCOTT DIXON: You know, I don't know how many times we go in and out of the pits over a weekend, but a lot. You can see it pretty clearly, yeah. 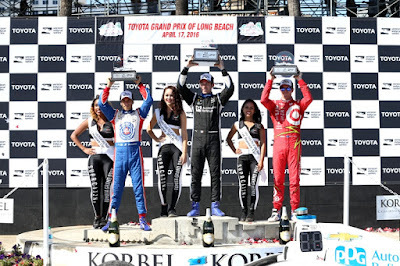 THE MODERATOR: We'd like to welcome to the podium the winner of today's Toyota Grand Prix of Long Beach, driver of car No. 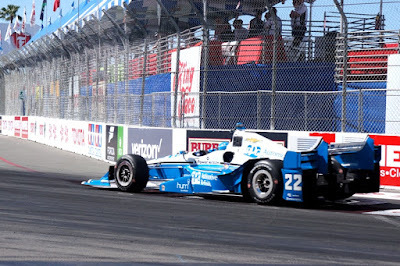 22, the PPG Automotive Finish Chevrolet for Team Penske, Simon Pagenaud. Simon earned his fifth career victory today, his first with Team Penske, his first win since Houston 2014. He extends his championship lead. Simon, congratulations. Q. When they said your pit exit was under review, was there any time when you were wondering, oh, can I have my magic moment kind of hindered here? SIMON PAGENAUD: No, I actually didn't know. Nobody mentioned it. (Strategist) Kyle (Moyer) didn't tell me on the radio. I just focused on the job. I really honestly didn't know it was that close. I wouldn't have changed anything honestly. We're talking -- to make it like an easy call to say it's no penalty or no warning, it would have been that much more. So it just made it great for TV and for you to understand, but actually INDYCAR has made it really clear this year what you can and cannot do, and it was certainly on the verge of being a stronger penalty, but I did get a warning. I only did it once in the race. Same for Munoz. Munoz did the same thing, so I guess it was a clear understanding for race control. Q. Simon, I know you made it clear, you said IndyCar has made it really clear what you can and can't do, but are you concerned that going forward warnings are kind of a gray area and if you're on the losing end you might get bit by somebody that gets a warning type deal? 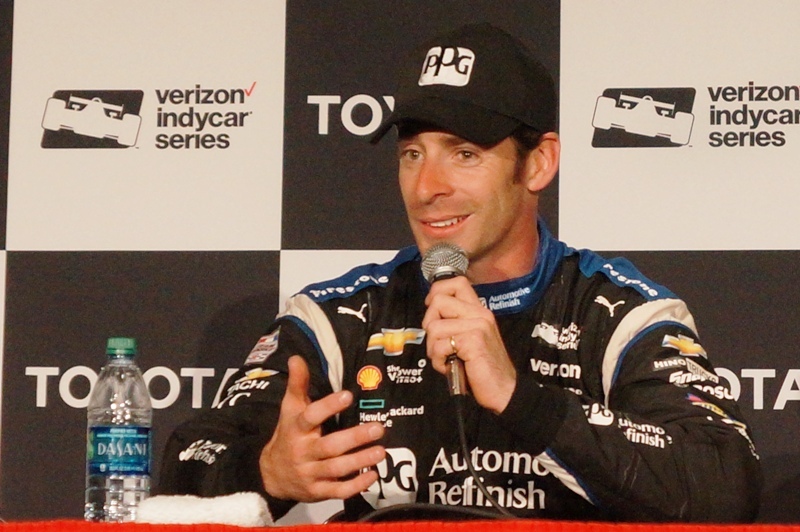 SIMON PAGENAUD: I mean, no, I thought it was -- they've done this manual. They've done a manual that they actually sent to all the drivers, and the drivers' association and IndyCar and the teams actually worked with IndyCar to understand what was going to be a warning, what was going to be a minimum penalty, so a warning, mid-penalty and higher penalty. Each one of those levels has a different consequence. You know, going into the race, I know the rule book, so I know that that line, I know you can take risks. I know you can get on the limit. It's just racing at the end of the day, and quite frankly, like I said, another inch to the right wouldn't have changed the outcome of the race. Q. Remarkably this race stayed green, which is the first time it's happened in many years, and a lot of the drivers are saying it was too quick, and they would like a three-pit race, a lengthened race. What's your take on that? No, I don't have any -- it was very quick. I mean, it was like -- after 50 laps, I was like, wow, we're almost done here. The pace of the cars are really fast nowadays compared to 10 years ago. The pace is really, really strong. We brake really late. We carry a lot of speed through the corners and pretty fast on the straights, too. We go up to 190 on the straight now. So yeah, there's a lot of speed. I don't know, personally it was fun for me as a driver because it was pure racing. It was about doing a perfect out lap, being on the limit every lap, so it's certainly not as exciting from outside, but I thought the pit sequence made it exciting. I'm a happy person. I thought our strategy worked out well, so personally I think the job is done. Q. Somebody was talking the other day, and they said that part of their problem with passing in a lot of corners is the brakes are so good that you brake way later than you used to and everybody can do it because the brakes are that good. Is that, in fact, a problem when you want to pass where you used to and now it's not so easy? SIMON PAGENAUD: Yeah, I think the cars are just -- I mean, actually before the weekend, I study a lot, as you guys know, so I reviewed a lot of onboard cameras from this track, and I reviewed Bourdais's lap from 2003 compared to Helio's lap from last year in qualifying, and it's incredible the difference. I suggest you guys look at it because our cars are really fast these days. They're a lot faster than we say. Certainly the braking zone is really short, and the aerodynamics are really high, so it's difficult to follow a car. But this track here has got a long straight, so it allows you to draft and get past in Turn 1. I did it two times today with two fast cars, so it's possible. It's just you kind of have to find different ways to make the car work in straight line. Race Control by a committee is not a solution because no one really ever knows when a rule is ... not a rule. Hard targets are never hard when no one wishes to have the will to actually enforce a rule, especially when the race outcome is at hand. To be clear, all decisions from Race Control are in the opinion(s) from three on-track race stewards that report to a President (as follows top to bottom - assumed) - JAY FRYE - President, Competition and Operations, INDYCAR | Trio of race stewards - Dan Davis, Max Papis, and Arie Luyendyk - race director Brian Barnhardt does not have a vote. One suspects that this (above) is where Scott Dixon, team owner Chip Ganassi, and Ganassi Racing Managing Director Mike Hull will direct their collective - as Scott Dixon put it ... "You know, I can't be mad at him [Pagenaud], so I'll direct my anger some other direction." When racing in the Verizon IndyCar Series, everything on the track is open to interpretation and the only hard targets that exist are concrete walls, catch-fencing, corner tire cushions, and, of course ... cars plus the debris from parts that come loose after the Green Flag flies. Thank you Race Control by committee for this operational clarification. 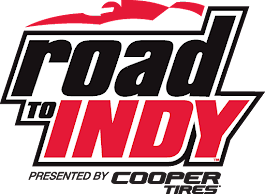 As for the series points championship after three rounds of sixteen scheduled, Simon Pagenaud (who finished second in each of the first two races) takes a 14-point lead over Dixon into the next event, the Honda Indy Grand Prix of Alabama at Barber Motorsports Park on April 24 (3 p.m. ET, NBCSN). Causes one to wonder even more - when is a rule, a rule? One might suggest that JAY FRYE - President, Competition and Operations, INDYCAR | Trio of race stewards - Dan Davis, Max Papis, and Arie Luyendyk - race director Brian Barnhardt does not have a vote - show this image to Target Chip Ganassi Racing (Chip Ganassi and Mike Hull) as well as 4-Time IndyCar Champion and runner-up to the #TGPLB42, Scott Dixon. O U C H ! - Race Control isn't even looking at the track during the race, one suspects, what with all of this post race video evidence of WHOLESALE Rule 7.10.1.1 violation going on! You know, with so many post race video confirmations on this Rule 7.10.1.1 violation, Race Control should slap a bunch of post race WARNINGS to those who crossed the line so that they all know rules are to be followed. If Race Control actually had consistency in the application of penalties on infractions and the intention to actually be effective ... half of the field will be racing at the Grand Prix of Alabama with timidity along with Simon Pagenaud and Carlos Munoz. Qualifications - Smashing and setting a record - Previous record of 183.599 at PIR held by Arie Luyendyk (March 23, 1996). Helio Castroneves, the 40-year-old Brazilian shattered the track record - set 20 years ago by Arie Luyendyk (183.599 mph) - by touring the historic one-mile oval in a stunning two-lap average of 192.324 mph to win the pole in his REV Group Team Penske Dallara-Chevrolet. Helio becomes the first driver to officially lap any one-mile oval faster than 190 mph - this would actually be a World Record mark as in a Guinness Book type of World Record. Chevy vs Honda results post Quals. (revisited later as a post race review) - Chevy had all top 10 positions on the grid. At Race tire failures - First, Helio Castroneves, after leading out strongly, has a tire go down – Lap 40 - and it is diagnosed as a cut tire (outside front right - inside breach). Second, also from the lead with as many laps on the tires as Helio, Juan Pablo Montoya's tire goes down – Lap 96 - it is the same tire position (outside front right - inside breach). The report on this one, however similar, is insisted to be from a different cause. Little explanation beyond this was given but the announcers speculated that since both cars were from Team Penske, that the camber may have been a bit over adjusted causing this tire failure to happen. Chopping while driving - Charlie Kimball, and Tony Kanaan seemed bent on "protecting" their line with semi-aggressive squeeze downs to the line ... some without any on-track penalty. Kimball pays with a spin on Lap 134 but Newgarden suffers. • Outstanding start, re-starts highlight Hunter-Reay’s run - A likely top-three finish for Hunter-Reay was stymied by caution flags that twice waved just after he had completed scheduled pit stops, dropping him well back in the field each time as his competitors took advantage of the yellows to make their own stops. The poorly-timed cautions negated an aggressive race start for Hunter-Reay that saw the Andretti Autosport driver gain five positions in the opening lap. Hunter-Reay continued to fight back throughout the 250-lap contest, making multiple passes for position on each succeeding re-start and surviving a late-race brush with the wall to finish 10th. • Rahal makes largest gain of the night to finish fifth - Rahal also had a strong race start and climbed through the field during the first half of the race, moving from 19th on the starting grid to sixth by the race’s Lap 125 mid-point. 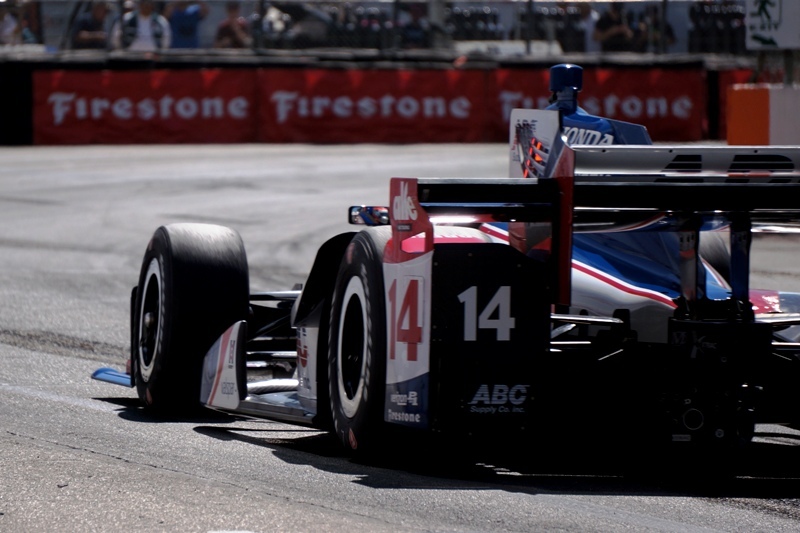 Rahal was able to both conserve fuel and maintain position through the remainder of the contest to net a fifth-place finish. • Ill-timed caution flags cost Hunter-Reay, Andretti and Rossi - Two other Andretti Autosport drivers, Marco Andretti and rookie Alexander Rossi, also had likely top-10 finishes taken away by the same caution flags that hindered Hunter-Reay. Andretti dropped off the lead lap as a result of the second caution on Lap 120, to finish 13th, while Rossi was forced to make a stop for a cut tire while the pits were closed during a Lap 197 caution, resulting in a drive-through penalty and 14th-place finish. At end - Debris and Yellow Flags ... not! Ryan Hunter-Reay brushes the wall and leaves carbon-fiber on the front stretch on Lap 240 ... 10 laps from the end-of-race. Yellow Flag finally flown on Lap 248 as Alexander Rossi brushes the wall - Race ends on a Yellow White / Yellow Checkered Flag. Bravo to Scott Dixon for his 39 Win and first-time win at Phoenix International Raceway. His win ties him for 4th on the all-time American Open Wheel win list with Al Unser. Next target on the list is Michael Andretti at 42 wins. 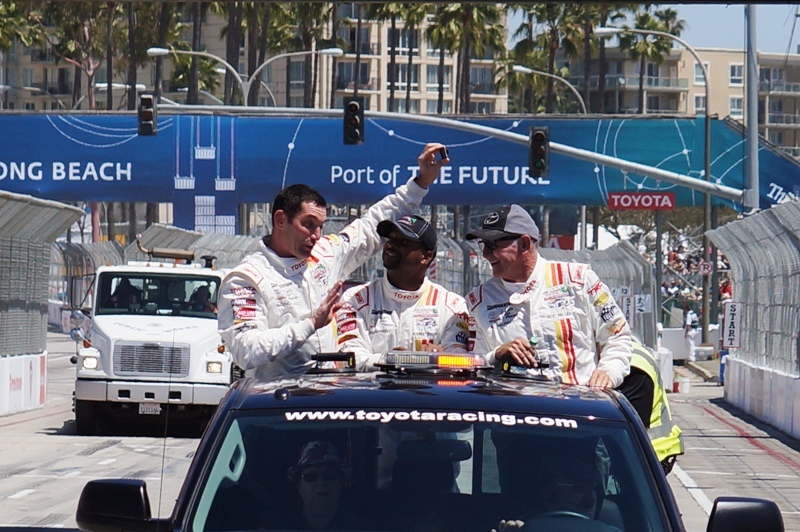 When Dixon was at 38 wins, he had 19 Oval and 19 Street/Road course ... going into Toyota Grand Prix of Long Beach ... he is going to have to win to balance this all up again! Chevy vs Honda results post Race - Graham Rahal wasn’t able to reach the podium but did break into the top 5 with a P5. No Honda engine cars led any laps and only two drivers were able to break into the top 10 at race end - Rahal P5 and RHR P10. Only 4 Honda cars were able to finish the race on the lead lap. In 2016 and 2 races, Honda cars have been in front of the field for 18 of the 360 laps competed. Phoenix International Raceway President Bryan Sperber said he was on "cloud 9" after Saturday night's intense 250-lap Desert Diamond West Valley Phoenix Grand Prix that attracted a crowd estimated just shy of 20,000. It was successful enough to all-but ensure the series will be back at the Avondale oval in 2017, but likely will drop to late April, possibly Saturday night, April 29. That's because the NCAA men’s basketball Final Four will be at University of Phoenix Stadium early in the month, and Easter next year is April 16. • Dixon has won an Indy car race in 12 consecutive seasons. It is a Indy car record. • This is the 101st Indy car victory for cars owned by Chip Ganassi. 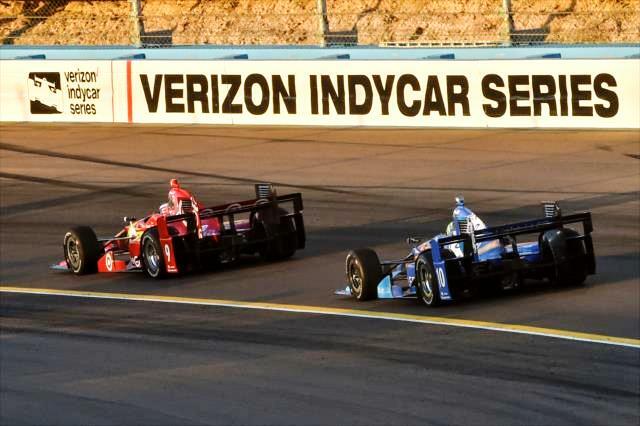 It is the first-ever win for Chip Ganassi Racing at Phoenix International Raceway across all series that race here. • Simon Pagenaud finished second. It is his 14th career podium finish and second-consecutive second-place finish. Pagenaud leads the Verizon IndyCar Series point standings for the first time in his career. • Will Power finished third in his first start of the season. 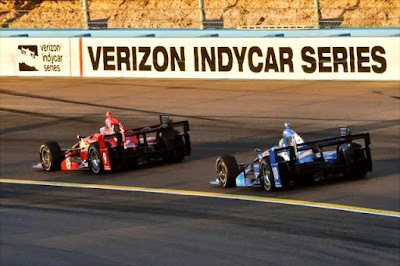 • Tony Kanaan finished fourth, his fourth top-five finish in as many starts at PIR. 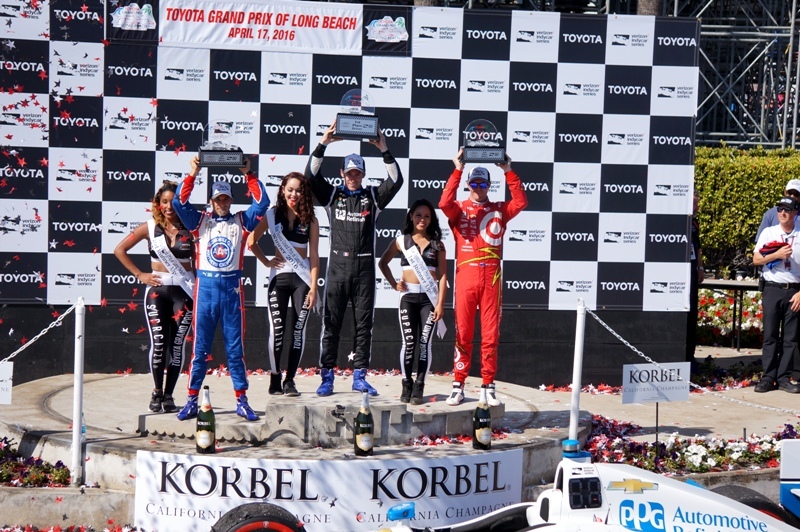 • Graham Rahal finished fifth, his season-best finish. NEXT UP: The majority of the series will participate in a test at Indianapolis Motor Speedway on Wednesday, April 6. 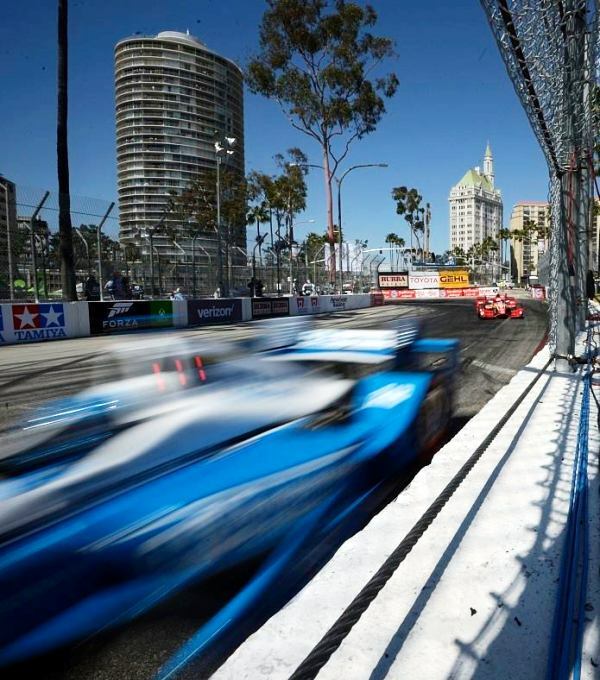 Round 3 of the Verizon IndyCar Series season will be the Toyota Grand Prix of Long Beach, April 15-17. The image above was posted by a fan on Facebook and it caught the attention of its single signatour, car builder and racecar driver, Jim Busby. 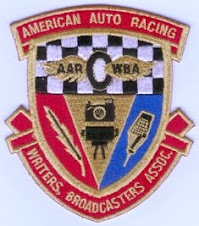 This episode of a shared motorsports FB story reminds one of the syndicated Paul Harvey radio broadcast "The Rest Of The Story" ... a national radio program that ran from 1976 until Paul Harvey's passing in 2009. You'll remember hearing - "'Hello, Americans,' he would say at opening the program. 'This is Paul Harvey! Stand byyy for Newwws!'" The Rest of the Story was a Monday-through-Friday radio program originally hosted by Paul Harvey. Beginning as a part of his newscasts during the Second World War and then premiering as its own series on the ABC Radio Networks on May 10, 1976, The Rest of the Story consisted of stories presented as little-known or forgotten facts on a variety of subjects with some key element of the story (usually the name of some well-known person) held back until the end. The broadcasts always concluded with a variation on the tag line "And now you know the rest of the story." How cool is Facebook! Someone just posted this. I don't remember signing it as a promo picture for BFGoodrich, so it must have been a fan's picture that they brought by for an autograph. 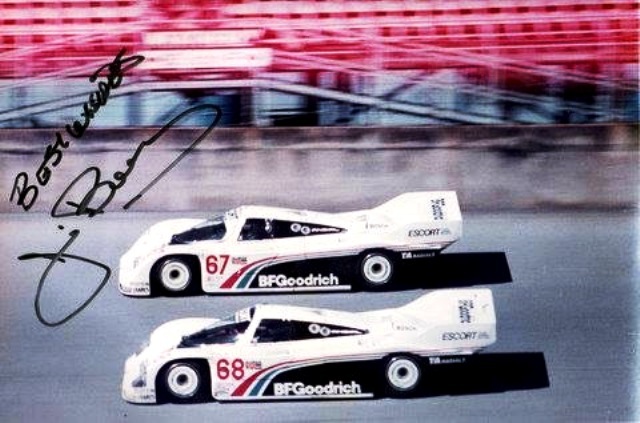 The best part of this picture is that it was snapped at the 1985 Daytona 24 hour race and the shot appears to be taken at the Start finish line with both of our cars in the frame. Both of these 962 Porsches were brand new for this race. Only minutes later the 68 car would be completely demolished at this same spot on the track. Pete Halsmer was lapping a slower car at 200 MPH. They came together and It sent Pete into the concrete wall. Pete was ok, but it was the end for the 68 car. The 67 car went on to lead much of the race and finish 3rd with me, Jochen Mass and Rick Knoop. Thanks to Facebook I've seen many photos of our cars over the years that I may never have seen otherwise. So, as Paul Harvey would be keen to say at the closing of his regular syndicated national broadcast daily noontime news program - 'This is Paul Harvey, ... Good day!' - which was delivered with a down note on Harvey, then an up-tone note on the word, day.